Do you ever find yourself wondering why your pet’s breath smells so bad? Is it bad enough at times to clear the room? You are definitely not alone. Periodontal disease is the #1 problem in dogs and cats. Approximately 85% pf pets are affected by the age of 3 years. Periodontal disease is defined as infection and inflammation of the tooth attachment apparatus (periodontal ligament and jaw bone), caused by toxins that are released from bacteria. It begins when bacteria form on teeth in a substance called plaque. If plaque is not removed, the plaque is calcified by the minerals in saliva to become calculus (or tartar) . Once the plaque gets under the gum, it starts causing inflammation (“gingivitis”). Gingivitis is the initial, reversible form of periodontal disease. Gingivitis can be painful to your dog and may lead to premature tooth loss. If this inflammation is not controlled, the bacteria within the gingiva create more severe inflammation that leads to irreversible periodontal disease. A dental prophylaxis is the gold standard for cleaning your pet’s teeth. This is performed in the hospital under general anesthesia. A complete oral exam is performed with evaluation of all of the teeth surfaces, oral cavity, probing of the gum line for any hidden issues. The teeth are then scaled of the build up of tartar on the tooth surfaces as well as below the gum line with our dental machine, then they are polished. The pet is then woken up and goes home the same day. How often this is done is based upon the individual and how quickly the buildup returns over time. Most pets need several cleanings over their lifetime to prevent irreversible disease. There are also many things that can be done in the home environment to help slow down the progression of periodontal disease. They are outlined in the below paragraphs. 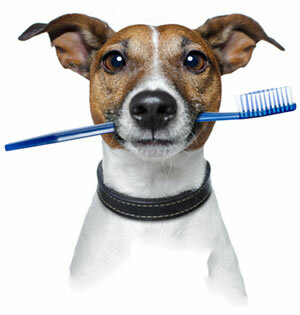 Tooth brushing is the primary preventative care for maintaining your pet’s dental health at home. When you think about it in human terms, it makes more sense. We tend to go to the dentist for full cleanings every 6 -12 months and brush our teeth twice a day. For the best results for our pets, it is best to perform at least 2 to 3 times a week, but daily brushing is best. There are several products that we recommend for this. (link to C.E.T. toothpaste/brushes) As far as toothpaste goes, a pet specific toothpaste that has an enzyme additive is the best choice. This aides in the breakdown of plaque in a more rapid fashion than toothpastes without it. Avoid human toothpastes as most contain fluoride in high enough concentrations that if swallowed daily would be toxic.